“You, Shadow!” the slave master shouted, as though Evyn were deaf as well as dumb. Laughter erupted behind him. “Shadow” was what they called dogs or horses. Evyn burned with shame. Uncle Morgan had even stolen his name. Young Evyn is a Welsh serf in the 11th century. 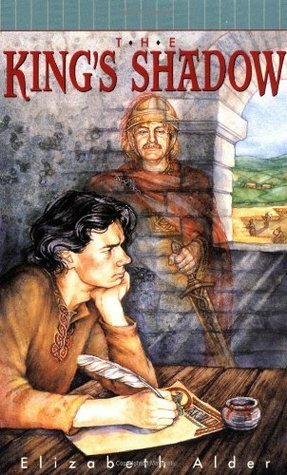 His life is turned upside down when his uncle betrays him and his father, leaving his father dead and Evyn a mute orphan. The uncle then sells Evyn into a life of slavery and pockets the money to repay a debt. Evyn becomes Shadow, a often mistreated and sometimes pitied slave boy. But his fortunes begin to change when he learns to read and write. He becomes a squire to Earl Harold and in time, the two become close friends. When Harold is crowned king, he makes Evyn his foster son. It’s a bond that will throw Evyn into the middle of two of the greatest battles of his time. It’s funny how some books fade from your memory within a week of reading them, while some linger for years. The King’s Shadow is one that has lingered. I read it in 2008, yet I still remember feeling furious at Uncle Morgan and deeply sympathetic towards Evyn. What’s your favorite time period to read about? Do you like any other books set in the 11th century? Oooh! I love 11th century! And anything within a few centuries around that. Definitely my favorite time period. After that, New Testament/Roman or 17th century. I’m really not a fan of modern day. I like some sci-fi or futuristic stories because I can better relate to the modern setting (can you say COUNTED WORTHY?? ), but I don’t generally like modern, realistic fiction. Can’t say why. Cool! I bet you’d like this book then.